I like bacon. Alot. I mean, it's BACON. It's smokey, salty goodness. It should be no surprise that we go through a lot of bacon in our house - after all, my husband is a chef that has a tattoo dedicated to bacon. That's love right there. Every once and awhile my husband gets a little crazy and makes candied bacon (with brown sugar & maple syrup) that is seriously the best stuff on Earth. He swears that any type oven cooked bacon (candied or not) is the best and well, I agree. 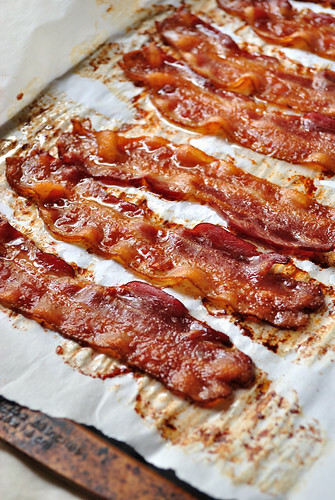 Oven cooked bacon is super easy, takes only a few minutes, and produces the best chewy yet slightly crispy bacon. If you've never tried it - DO IT! I promise you won't regret it - I mean, either way, you've got bacon. 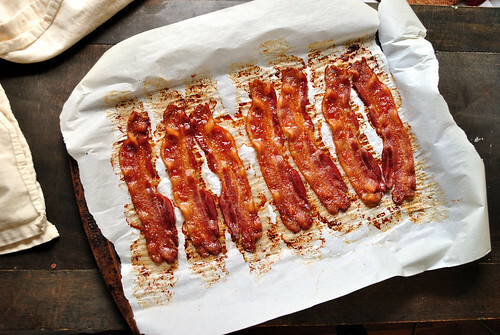 *edited to add: If you like super crispy bacon, place bacon on a rack and then place rack on baking sheet.